Every single time I've gotten on Pinterest in the last six months at least one of my friends has pinned a recipe for some sort of chicken cordon bleu pasta dish. Since most of my friends are a lot like me (women who work and have families with busy schedules), I tend to pay attention to the food they’re pinning. Because if they want to cook it, I imagine a lot of my readers do too. Y’all didn't know that did ya? That you’re my own little private test group? Yup. Pretty much. I ain't shame. Dione, if you don't pin this one I'm disowning you. Anywho, I kept seeing recipes similar to this. And I wanted to cook one so bad but something just kept putting me off. I just couldn't wrap my head around some of the ingredients lists I’d seen. But I still wanted to make it. And when I spotted one of the packs of cubed smoked ham in the grocery store this weekend it was like a light bulb went off. Yes! That’s what it needs! And speaking of cubes, well, duh, that’s how I should do the chicken too. I was getting off track with recipes when I’d see they called for frozen fried chicken tenders and deli ham slices. I mean, I like those things but not really in a casserole. Ya know? So I thought about some of the key components in traditional chicken cordon bleu: chicken, smoked ham, Swiss cheese, thyme and bread crumbs for coating. OK, I can work with that. I really didn't feel like making a béchamel sauce so I borrowed the idea of making a sauce with cream cheese from an "alfredo" recipe I once had. It was rich and creamy and did a great job holding the rest of the ingredients together. I threw it all together and hoped for the best! It was delicious and the leftovers were even better the next day! Spray a 13x9 baking dish with cooking spray; set aside. Cook pasta in liberally salted water per manufacturer’s instructions for al dente preparation; set aside. Meanwhile, heat and stir half-and-half, cream cheese, white pepper, thyme, cayenne pepper, garlic, salt and Dijon mustard over medium heat until cream cheese is melted and mixture is smooth. 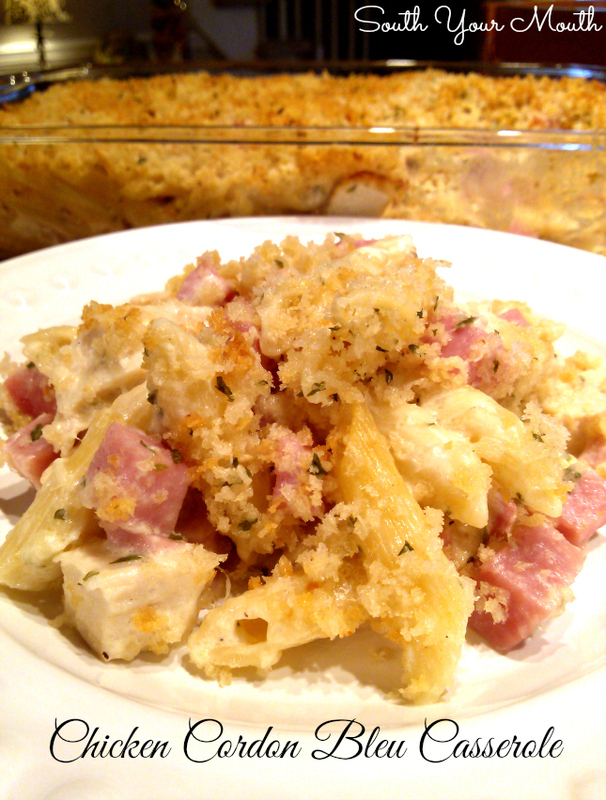 In a large bowl, combine cooked pasta, ham, chicken and cream sauce. Fold in Swiss cheese. Pour mixture into prepared baking dish. In a medium bowl, combine panko, salt, garlic and parsley. Mix in melted butter. Sprinkle panko topping over pasta mixture. Bake, uncovered, at 350 degrees for 30 minutes or until panko is light golden brown. *These little packs are usually found near the whole hams in the refrigerated section. If you can’t find a pack already cubed, just buy a ham steak, trim the fat and cut it into cubes. **I just poached mine in some water with salt and pepper then cut into cubes. OMG!! That recipe sounds soo very good. I can feel my thighs and hips expanding just reading it but it would be so worth it. I could exercise a little more just to get a taste. Thank you for the recipe I will definitely pin it!! Ok, you shamed me into making this tonight. I've seen it every time I get on Pinterest too (which is A LOT) but I love your sauce idea with the cream cheese. Throw in a little garlic bread and I am there!!! You had me at cream cheese....love this recipe! Pinning right now. Ooohhh,,,this was soooo good! I made this tonight along with steamed broccoli and coconut pie. I used a chunk of pre-sliced black forest ham from meat counter. I anticipate no leftovers once my son comes in from work. Off to hide some in the refrigerator. Great recipe, as are all the ones I have tried from your blog. This is one of my favorite curry dishes, thanks for sharing this. I love Chicken Cordon Bleu, but my husband definitely does not. I'm always looking for new ways to try it so he won't mind it so bad. Putting this on the menu for next week. made this a couple of weeks ago, was a big hit. My son and his soon to be wife really liked it. He really loves chicken cordon blue (they are having it at the wedding). I have never made a sauce with cream cheese, and was not sure if I would like it, but it was great. I did cheat a little and used seasoned salad croutons ground up for the topping worked very well. Just by reading the ingredients, I can almost taste how delicious this is! I know, I know, this is southern cooking, but do you think this dish would work if I used milk instead of half and half....or would it come out too 'watery'? I think you could make it work! I'd start with less (say 1.5 cups) and add more if needed. You're looking for a sauce similar in consistency to alfredo. I made this exactly as stated and it was wonderful. I think next time, I will cut the recipe in half-----it makes a lot for 2 people. But we enjoyed it for a few lunches and dinners! Hi Mandy. I made this for dinner last night and it was excellent. We really loved it and I will definitely be making this again. (By the way, I think I found your site through Christy at Southern Plate and/or Stacey at Southern Bite). Thanks for the great recipe!